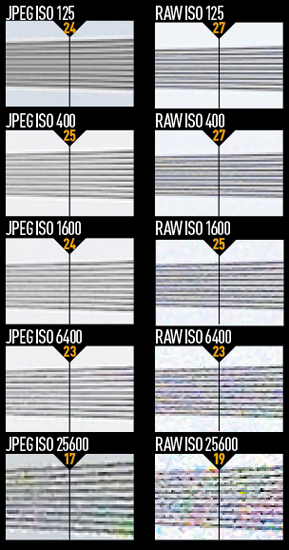 These images show 72ppi (100% on a computer screen) sections of images of a resolution chart, captured using the fixed 45mm f/2.8 macro lens. We show the section of the resolution chart where the camera starts to fail to reproduce the lines separately. The higher the number visible in these images, the better the camera’s detail resolution is at the specified sensitivity setting. In keeping the same pixel count as its predecessor, there is no improvement in the level of detail that can be resolved by the Lumix DMC-GH3 in good light, which is up to the 27 marker in raw format at ISO 125. This level of performance is equal to equivalent DSLRs such as the Nikon D7000. Where the performance has been enhanced is for low light, with the camera able to maintain the level of detail it can resolve further up the ISO range. 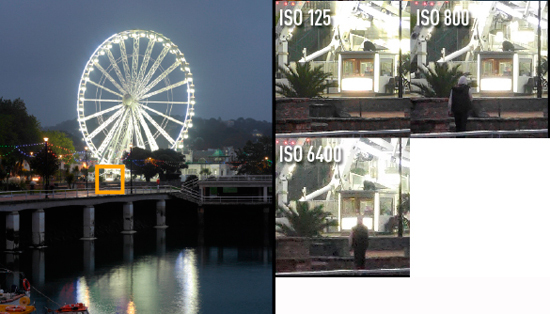 At ISO 12,800, the GH2 reaches the 14 marker on our charts, while the GH3 is at the 22 marker. However, that is not to say images are without luminance and chroma noise. The first real sign of luminance noise in highlight and midtone areas is at around ISO 1600, while images at ISO 800 are a little flatter in tone than the lower settings. Detail is still rather good even at ISO 6400, and it is not until ISO 12,800 and 25,600 that noise is a real issue in terms of quality of detail and depth of tone. As I would expect, the extended ISO 25,600 setting has severe chroma noise, too. Overall, these results are a marked improvement from what has come before, and this sensor certainly provides the best low-light performance from a four thirds camera to date. Compare it to an APS-C sensor of similar spec, however, and the GH3 is not quite there yet.